Israeli instructor Michal Shahak led students through a healing through movement workshop on Tuesday, October 9. 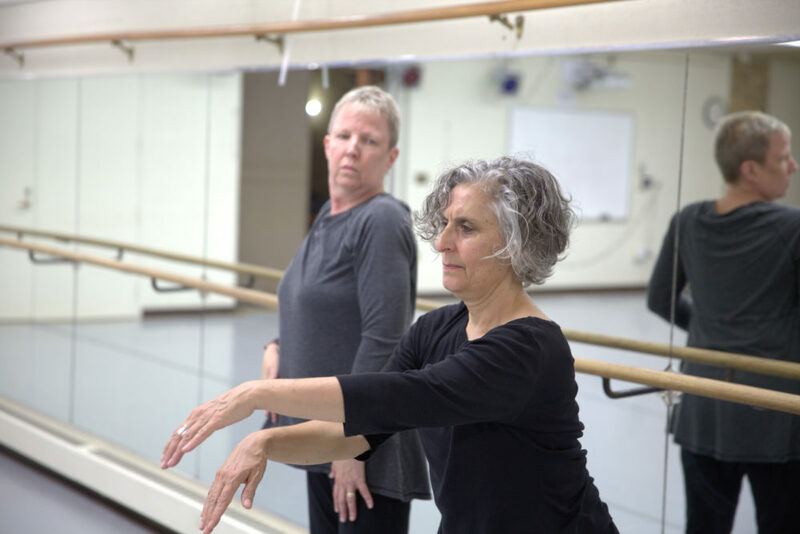 Michele Rusinko and Michal Shahak in Gustavus's Kresge Dance Studio. While Gustavus Adolphus College students regularly add to their learning with guest lecturers and research opportunities outside the classroom, students in the theatre and dance department got the chance to do things a little differently this week – through a movement workshop. On Tuesday, October 9, students were able to experience this kind of supplemental learning through a workshop by Michal Shahak, an internationally known movement therapist and educator who specializes in trauma healing. The workshop, titled “The Body In Conflict Resolution,” allowed students to focus less on technique (as they are used to in their day-to-day classes), and more on mindfulness. Throughout the two-hour workshop, Shahak led students through two 15-20 minute movement sessions, had them work both in groups and by themselves, and asked students to reflect on their experiences afterwards. This workshop was not the first time Shahak has visited and worked with students and faculty at Gustavus. Two years ago, she was involved in the collaborative creation of a dance called “Graywolves” with professor Michele Rusinko. The two met at a mind-body centering workshop in 1991 and have stayed in touch ever since. The workshop had the desired effect, Rhoten said.